Crocus (Crocus spp. ): growing, planting, caring. This description is for spring-flowering crocuses - one of the earliest flowers in the garden. Scientific name : Crocus spp. Varieties of crocuses cultivated for decoration mainly represent five species: C. vernus, C. chrysanthus, C. flavus, C. sieberi, and C. tommasinianus, with flowering time varying from the late winter C. tommasinianus to the later large hybridized and selected Giant "Dutch crocuses" (C. vernus). Did you know? 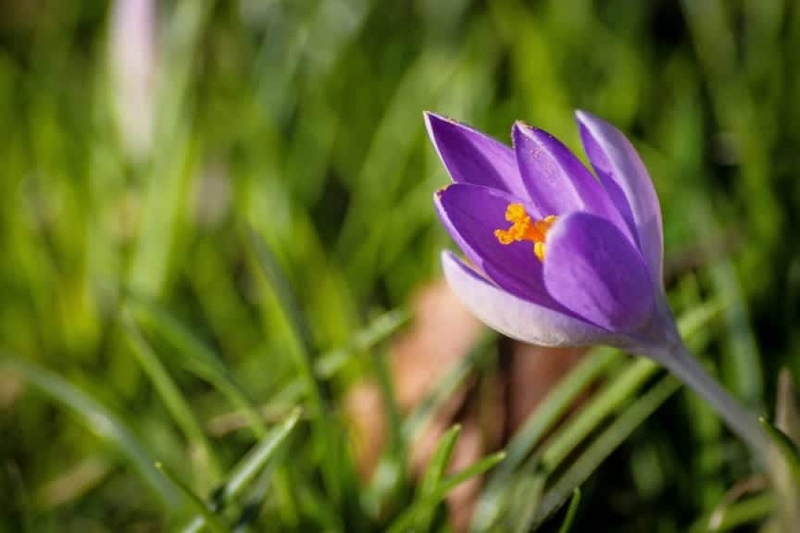 Crocus flowers and leaves are protected from frost by a waxy cuticle - explains why early flowering crocuses can bloom through a light late snowfall. Crocuses are small, early-flowering bulbs, between February and April. Six tepals form upright yellow, blue, violet, white or pink flowers with semi-erect and linear leaves. Plant the spring-flowering crocuses in the fall, or even in the late summer to allow the bulbs to take root well before the cold weather. Planting is simple: bury them 4-5 cm in ordinary or poor soil, sandy, well drained, exposed to sun or partial shade. If your land is not very draining, put some sand in each planting hole. Little trick! To avoid rotting bulbs, roll them in wood ash before planting. Ash enriches the earth with potash and has a protective action against fungi! If you plant in a massif, you do not need to turn the soil very deeply and disturb it: prepare the soil locally by scratching it. In a lawn, bury the bulbs with a dibble. Throw them in the air, and plant them where they fall! In a pot, make a mixture of potting soil, sand and loam, and plant 5-10 cm deep. Water, tamping to leave no air bubbles. Crocuses may require weekly watering in winter and spring if grown in pots indoors.